Merged data from on-the-ground measurements, aerial photography, satellite imagery and satellite-radar imaging have unveiled an unexpected geological consequence of northern California's ongoing drought. Initially, University of Oregon scientists were perplexed by new satellite data that indicated that trees and rocks atop 98 slow-moving landslides in northern California's Eel River Basin were no longer flowing at historical rates seen between 1944 and the turn of the century. Many of the formations, they could see, had barely moved in the last three years. "We realized that this slowing down of the landslides was a massive signature of California's drought," said Joshua Roering, a professor in the UO Department of Geological Sciences. "Finding this was an accident. We didn't set out to connect our research to climate. We discovered this by being frustrated by the data." The research, led by Roering's postdoctoral researcher Georgie L. Bennett, is detailed in a paper accepted for publication in the journal Geophysical Research Letters. The findings, she said, are important to scientists monitoring landslides worldwide, including at similar sites she has visited in Italy. 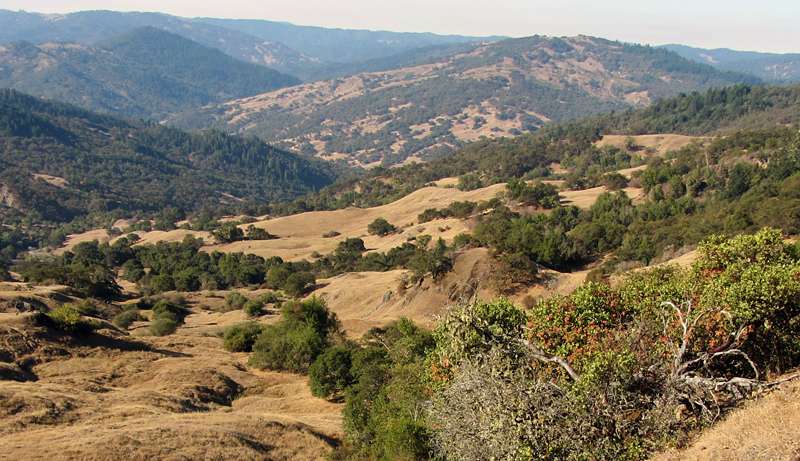 Many Eel River Basin landslides have been slowly moving for thousands of years. The new study shows that the landslides, based on the 10 most-scrutinized landslides, slowed by half twice between 2009 and 2015, a period when the region experienced unprecedented drought. Rates of historical movement vary by the size and depth of individual formations, Roering said, adding that, in general, the landslides had averaged "a few feet" annually. Small landslides are more sensitive to seasonal periods of rainfall and drought, while larger landslides more likely average out impacts from climate variability, the researchers found. "Landslides move highways and make things really difficult for engineers all over the western U.S., and all over the world," Roering said. Understanding the interior plumbing of landslides, especially how moisture affects "the conveyor belt" that keeps them moving along the surface is vital to maintaining safety and for projecting conditions that may indicate a catastrophic collapse that could dam a river or destroy a highway, he said. "The landslide outflows we studied are typical in many places in the world," said Bennett, now a postdoctoral research associate with the U.S. Forest Service and Colorado State University. "This paper is important to helping understand how landslides respond to rainfall, and it provides data that should eventually help in terms of forecasting how landslides will respond to climate change. Smaller outflows are more sensitive to increasing or declining amounts of precipitation." The study area covered an 86-square-mile stretch along the 200-mile-long river, which meanders through the coastal mountain range from just north of California's wine country to near Fortuna, where it meets the Pacific Ocean. Data collection on such a scale had not been done before, Roering said. "The difference here is the amount of data we looked at," he said. "People have been putting equipment on landslides and watching them for years—long before GPS and lasers. We were able to do this on a massive scale. This was a systematic look at the whole landscape—what it's doing—not just of one feature." Researchers found that the rocks and soil have dried substantially, based on groundwater data gathered at one of the locations. The current lack of moisture, Roering said, means there is no longer enough lubrication to allow for movement. This summer, his team, in collaboration with a team led by UO seismologist Amanda Thomas, will place 80 small seismometers in various locations on one of the landslides. The project aims to locate the underlying water table. "A question now is how much water will it take, and how long will it take to get water down the depths at the base of these sliding surfaces to reduce the friction and get them to start moving again," Roering said. "The site we will be instrumenting should help us better understand the structure and plumbing of landslides." Data merged in the research came from manual measurements of movement based on tracking trees as they surfed on the surface of earthflows between aerial photographs from 1944 to 2006 and from automatic measurements obtained through satellite pixel tracking from high-resolution imagery spanning 2009-2015. The satellite tracking was validated using the remote sensing technology interferometric synthetic aperture radar (InSAR). Bennett, who soon will join the faculty at the University of East Anglia in England, compared the data on landslide movement from 1944 onward with an index of drought known as the Palmer Drought Severity Index.